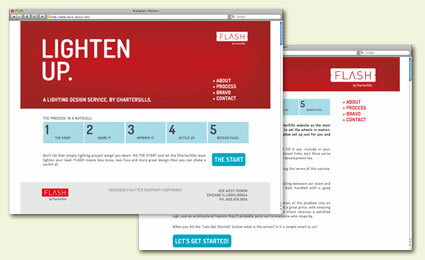 Project Description: FLASH by Charter Sills is a collaborative effort between Six Demon Studio and the Winter Agency. SDS wrapped the design created by the Winter over a content management system and added search engine friendly behind the scene pieces to make Charter Sills’ vision for FLASH come alive. The idea behind the FLASH website was to extend Charter Sills’ reach into the smaller industrial and home architectural light projects. The site would explain the process of dealing with FLASH via tools such as GoToMeeting, Dropbox and Facebook. Once the potential customer was ready to take the next step with their project, the website would act as a lead generator and help the customer send and email kick off the process. In conclusion, the FLASH by Charter Sills project was a great first collaboration between SDS and the Winter Agency, one we hope to continue in the future. The project was also a success for Charter Sills exceeded their expectations, we look forward to working with them in the future as well.